Vacation rental duplex. Sleeps 46, 12 bedrooms, 14 bathrooms. No pets allowed. Guest Bedroom - Large enough for a Family! 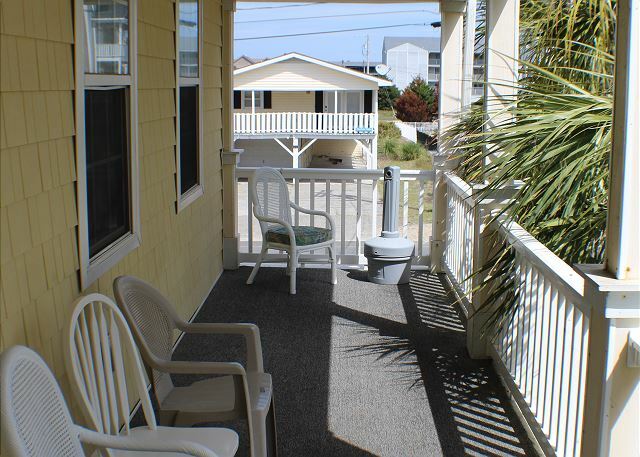 This raised duplex is located in the Cherry Grove section of North Myrtle Beach, just across the street from the beach. The "Sunrise" side provides an ocean view and wonderful sunrises over the ocean! And on the "Sunset" side you'll enjoy pool views and colorful sunsets over the marsh. Each unit is three stories with connecting doors on the first and third floors when rented as one property. There is a shared pool and two hot tubs. The total house offers 2 kitchens with double appliances in each -- 4 refrigerators / 4 stoves and 4 dishwashers. The first floor includes: a large spacious living room with sectional couch seating, kitchen (with double the appliances), dining room with 2 tables offering seating for 12 (plus additional breakfast bar and bar stools), a full bathroom (shower only), and a large separate laundry room with washer/dryer. The second floor has 4 bedrooms and 4 full bathrooms. On this floor there are 3 Bedrooms with 2 queen beds in each and the 4th bedroom has 2 twin beds. Each bedroom has it's own full bathroom and a new 54 inch flat screen Samsung HD smart tvs, with access to all of the entertainment apps. The third floor is where you'll find 2 more bedrooms with 2 full bathrooms and the game room. The Master bedroom has a king bed, jetted tub and separate shower stall. The second bedroom on this floor has a king bed and a queen bed with private bath. 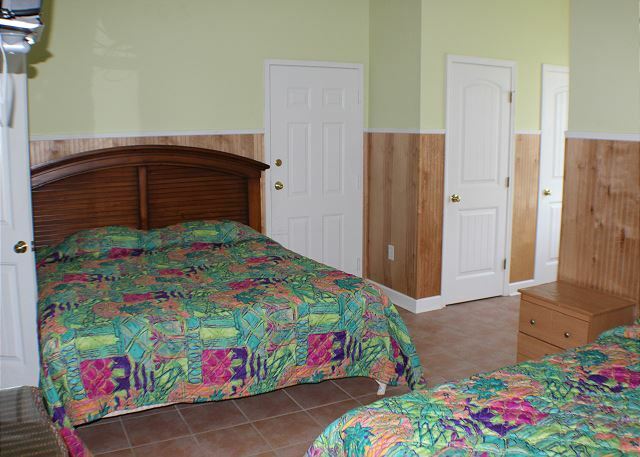 These bedrooms have also been updated with flat screen Samsung TV's. The game room has a widescreen TV, arcade game and kids boxed games for those friendly family competition nights. The game room also has 2 bars - one large and one small wet bar on each side of the room - with mini-fridge, microwave and sink. This is an exact mirror image of the "Sunrise" half , the first floor includes: large spacious living room with sectional couch seating, kitchen (with double the appliances), dining room with 2 tables and breakfast bar with bar stools, first floor with full bathroom (shower only), and separate laundry room with washer/dryer. The second floor has 4 bedrooms and 4 full bathrooms - 2 queen beds in three bedrooms and 2 twin beds in the last bedroom. All bedrooms have a new 54 inch flat screen Samsung HD smart tvs, with access to all of the entertainment apps. The third floor houses 2 more bedrooms with 2 full bathrooms plus the game room. The master bedroom has a king bed with a jetted tub and stall shower. The other bedroom has a King and a Queen bed, private bath. Both of these bedrooms have been upfitted with new Samsung flatscreen TV's also. The game room has a pool table and arcade game. A large and small wet bar on each side of the room round out this floor - includes a mini-fridge, microwave and sink. OUTSIDE: Enjoy grilling outside at the charcoal grills with bench seating! The house includes 6 balconies to enjoy the ocean breeze. Public beach access is just a short walk down the block! PARKING: There is parking for about 14 vehicles. It's OK to rent golf carts -- making it easier to get around town! BEACH INFO: About 1.5 block walk to the public access and the beach. There are 2 storage closets. Our family enjoyed our Christmas stay and having two kitchens and plenty of room and bathrooms was so nice. We all want to come back again. Thank you for taking the time to review this property. You really picked the best occasion to have a large family gathering in a very special home. We hope you will come back -- winter or summer. The owner is currently remodeling the "Tropical Impulse" home with new paint, hardwood floors, new mattresses and bedding, as well as new pool tables have been ordered. The details will surely impress. The double kitchens will be fully re-stocked with all of the extras for creating those family reunion meals. 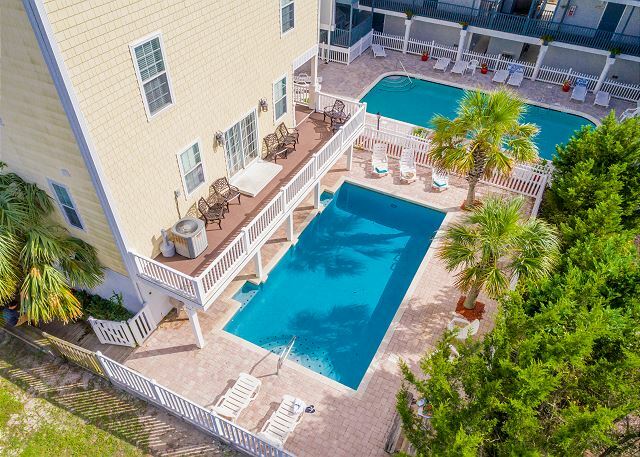 This great house is perfectly located just across the street from the beach; so you can travel from the sandy beach or to the pool sun deck as many times as you wish. We do appreciate you choosing to stay at an ODVR property and we are here to help with plans for your next trip. There was room for everyone and we all had a blast. We could see that the owner is doing upgrades to the place and we can't wait to come back when it is done. Had issues with AC on Sunrise side. Called twice about it. Third floor AC was not addressed.A lot of baths did not have a trash can. Lights in parking area did not work, very dark. The property suited our needs for 25 family members renting both house (Sunrise/Sunset). Everyone enjoyed the pool and hottub. The wrap around decks on the 1st and 3rd floor was very nice! The house has a lot of potential but it is in need of upgrades: ex. 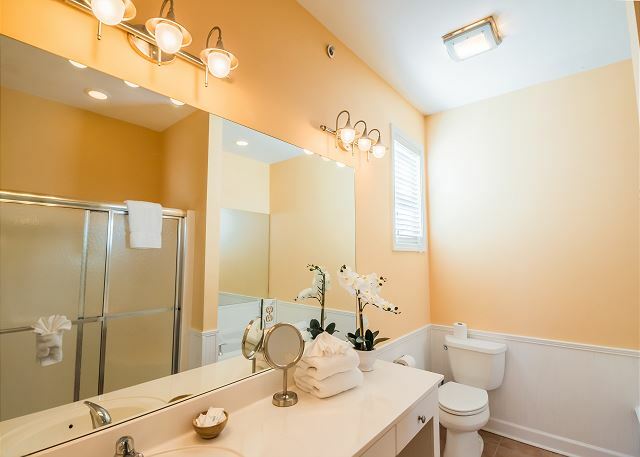 bathrooms are dated, beds were hard and old and the house was not completely clean. Need to update some of the furniture and appliances. Fix the pool table, it was too worn to play on. The internet was horrible so most of us opt not to use the Wifi. Glad the cable company came out after we arrived because most of us didn't have cable TV access. The house suited our needs based on the amount of people we had but with some inside changes/upgrades, this house is worth renting. Thank you for your review. We, at ODVR, certainly accept both positive compliments and constructive criticisms that need our attention. We apologize that we were less than perfect in a couple of areas. The cleaning issues that you mentioned are important to us, too, and any guest is welcome to call the office during their stay to point out things that might have been overlooked and give us a chance to make it right. Your happiness and comfort are top priority. Maintaining the Tropical Impulse house is an ongoing priority for the new owner, too, so your suggestions for improvements are duly noted -- the latest improvements include new furniture ordered for the dining areas and 12 brand new 54" flat screen tvs were installed in all of the bedrooms in August. Thank you again and we hope you will give us another chance to impress you as progress is made to this great family beach house. The location, hot tubs and private pool make this an easy vacation pick, but there is more to come in the near future. The property was exactly where we had hoped it would be close enough to the beach that we could walk with little kids. We did not bring beach wagons as the property listed that they had them but sadly found out no wagons were there. The pool was cleaned a few times throughout the week which we loved and the game upstairs in Sunrise unit the kiddos enjoyed! Sadly we ran into a few things wrong with the property upon arrival some sinks would not fully drain (Maintenance was out the following day to fix it EXCELLENT), there was mold growing in both sides of the house ice makers (we just bought ice for the week), family members had unknown stains on walls in their rooms, we also were told half of the TV's did not work due to cable issues, we also had a terrible leak in one of the bedrooms that the house cleaner informed us of when we were walking into the property. The kitchen was fully stocked with plates and anything we needed. Prior to arrival we called and asked about portacribs and high chairs we were told both units had both but were only able to find the portacribs. The ladies in the office were phenomenal!!! Overall I would give this rental a 3.5/5. We rented both sides of this duplex for a family reunion over 4th of July Week. Pros: The rental company was great. The location was perfect with just a quick walk across the street to the beach. The Pool was private and amazing...clean with plenty of shade if needed from the two palm trees and an overhand from the porch above. The unit was HUGE...more than enough refrigerator and cooking space. The air conditioning was super cold if you like that...we found ourselves wearing sweatshirts to bed in several of the bedrooms because it was so cold...even while continually turning the temperature up! Now for the Cons: The beds are very uncomfortable, mattress pads only about 4-5 inches thick. One of the box springs in my son's room was broken and sagging leaving the bed lilting to the right. With the exception of what appears to be new living room furniture, any other chairs in the house were disgustingly dirty and stained. Only a couple of the bedroom tv's were working and some areas had TV hook-ups but no TV's! The cleaning service is sketchy. I understand the unit is incredibly large, but there was a lot of dust and grime all over. There were hairballs on the floor, a few of the toilets were moldy when we got there and one of ice bins in the refrigerator on the Sunset side also had mold in it. The pool table...although I don't expect something really nice...needs some TLC. The felt is wrinkled and the table sags in the middle (which makes for some pretty interesting shots). Overall...if you're looking for something large and affordable, I'd recommend it. If budget isn't as much of an issue...steer clear! This rental property was perfect for our youth group. We rented both sides and had lots of room for everyone. close to the beach, great pool, nice furniture lots of bathrooms! Quiet area not crowded. loved it! Thank you, thank you, thank you. Tropical Impulse is a large beach house, just steps from the beach and offers a great multi-level living space for groups and families. The home can be rented as one side with six bedrooms or both sides if you need all twelve. Both kitchens are well stocked with two of every appliance to make sure meals are an easy process, even grilling out by the pool is a good option. So glad that this house worked for your group. 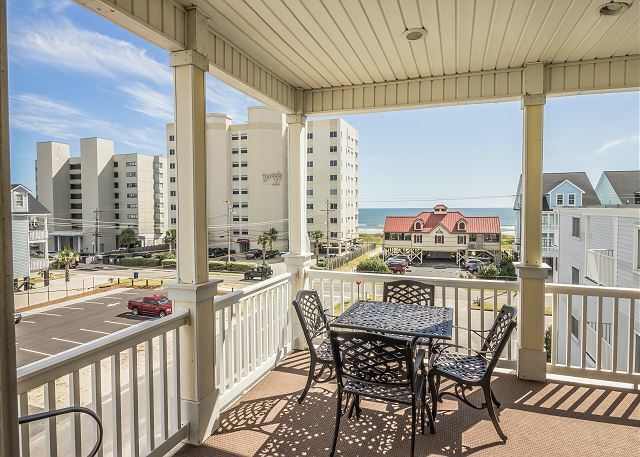 Cherry Grove is a wonderful beachside community and a favorite for those who want a little less crowd on the beaches. We appreciate that you took a minute to let us know that everything was great and hope to see you again. So happy to hear that you enjoyed your stay at our Tropical Impulse House. You are so right, it is very spacious with 12 bedrooms and 14 baths there is plenty of space for all. There is plenty of fun to be had with the pool, hot tubs and game rooms. Thank you again for staying with us and we hope you will join us again. The rental experience was excellent. All the employees at Owner Direct were a delight to talk to. They were kind, thoughtful, and very responsive. Everything about the house was in great condition and all the financial aspects of the transaction were handled appropriately and timely. I would definitely rent from Owner Direct again and again! Overall, I am very happy with Tropical Impulse. We had a softball team (parents & kids) stay at the unit for a week during Nationals, and there was plenty of room for all. It was close enough to the beach for everyone to be happy, and we loved all of the amenities. The folks at Owner Direct were very helpful, courteous, and took care of any issues we had without delay. We will definitely come back next year! Thank you so much for taking the time to complete our survey Tim, we appreciate it. Tropical Impulse is a new property to us and you were our first rental, we are happy to hear that ya'll enjoyed it. Tropical Impulse is a Duplex that has it all! The House has 12 bedrooms and 14 bathrooms, sleeps up to 44 people total!. TWO Fully stocked Kitchens with double appliances in EACH Kitchen - 2 fridges, 2 ovens, 2 dishwashers! Game rooms, hot tub and pool! Spectacular Rental! We enjoyed working with you as well Tim and we hope to see you again next year. Sincerely, Your Owner Direct Vacation Rental Team.